AOL believes it knows what you want to watch and when you want to watch it so well that it's placing bets on a 24-hour curated video experience. What appears in the AOL On network video feed will be dictated by a combination of data and human judgment. Maureen Sullivan, president of AOL.com and lifestyle brands, said the company has figured out that people enjoy different types of video at certain times. It's the same principle the company employs to decide which content to feature on its homepage, except the tales are going to be told in video form. "[Viewers] want that curated experience, but they don't have time to watch hundreds of videos every day," she said. For instance, readers tend to begin their mornings with hard news and business stories, but shift to health and beauty midday, Sullivan explained. Demand for entertainment coverage ramps up throughout the day, she said. AOL can use that information to help it program videos. But, it's not all about crunching numbers. 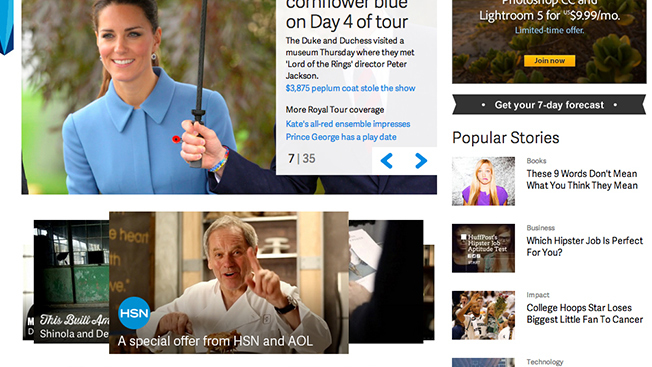 AOL will add human editorial judgment to select the best videos from its own stable of content and its partners. New AOL original web series will include Unfolding Now, a morning recap of the news, and Late Night Laugh, a roundup of the previous night’s airings of late night talk shows. There will also be shows about Tuesday new releases and weekend previews for movies, courtesy of Moviefone. Experts will be called upon to share their knowledge with AOL's loyal viewership. As for partner content, there's a wide variety to choose from, considering that AOL has agreements with CBS Brand Studios, Condé Nast Entertainment, ESPN, E!, Sports Illustrated, New York Times and Wall Street Journal, among others. "We've been calling it 24/7," Sullivan said. "That's how we're thinking about the programming." One of the new partners for the curated videos will be HSN (better known as the Home Shopping Network). AOL viewers will get exclusive offers through the web videos. As one example, they will get a chance to purchase Sofia Vergara's perfume, which is available only through HSN. Bill Brand, chief marketing and business development officer for HSN, Inc., said the network was drawn to AOL because the two companies are like-minded content creators. He believed HSN's strength was telling stories about products and brands, and the partnership will allow it to extend its audience reach. "It's really about targeting women to build content to reach commerce," Brand stated.